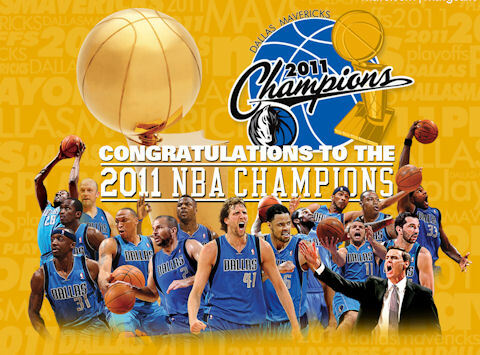 Last night the Dallas Mavericks defeated the Miami Heat to win the Mav’s first ever NBA championship. The Mavs won the good old-fashioned way with hard work and team work. They did not depend on three over paid classless “stars” to somehow work magic and get the championship. The Mavs had only one big time star, Dirk Nowitzki. What the Mavericks did have were 15 guys determined to work as a team. Though I want the Heat to get another ring, I’m very proud for the Mavs. Mavs do their best and show all the people that they are deserving to be champions. First, Mavs really did great job on winning it all in game 6. They really uses their experience as some of the players were already been more than a decade playing in NBA. And congrats to the team’s success as they became the 2011 NBA champs. I hope that some Super Star players learned a lesson…. that staying put, with the team, Owner, fans and organization that loves you, built around you, and stuck with you – and then winning ONE Championship ; is much sweeter than making a “decision” to become a mercenary and go somewhere to win NOT 6, not 7 not 8 (LOL) titles.. If it were not for Dwayne wade and bosh who only did good half the time the mavs would have won earlier. Wade was the best player on the team for the heat. It shows that Lebron can’t perform under pressure. Good game…well, let’s all I can say is that we’ll see you guys again next year NBA game. Thanks for sharing this post!